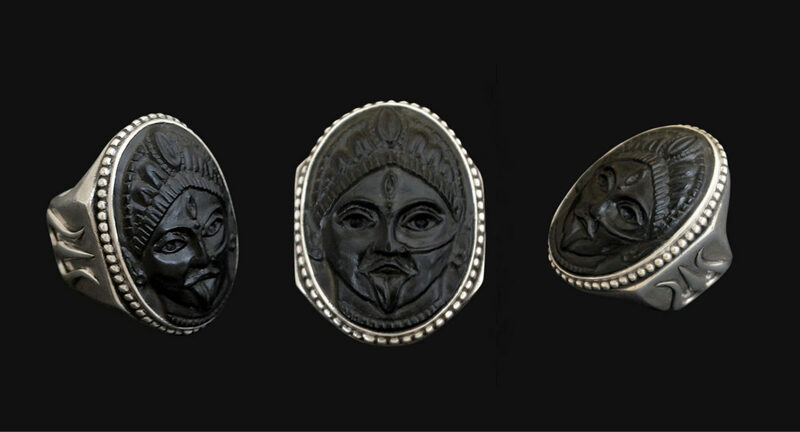 Hand carved Kali on Onyx and sterling silver ring. Heavy silver ring for One of One collection. Onyx 3.4 cm X 2.8 cm Trishulas setting hand-carved in wax and cast in sterling silver (56 g) Ring size P, (this one-off ring is now sold). One of One is a unique collection of exclusive jewellery designs. Each piece is hand-carved and made to be one. No reproduction is made and once is sold the design is forever gone. Each jewellery design is made with a particular cut of stone and/ or other precious materials.